It is with sadness as well as many great memories that the members of the 62-63 & 63-64 Ryerson Rams hockey teams announce the passing of our goaltender, Jack Morgan on 6 October, 2017. In the 62-63 season “Blackjack” shared the goaltending duties with Larry Pringle and helped lead the team to an undefeated season and the OIAA Championship. In the 63-64 season he took over as the team’s #1 goalie and played every game. In 2012, along with his 62-63 teammates, he was inducted into the Ryerson Athletics Hall of Fame. Jack is best remembered by his teammates for the confident demeanor he brought into the room as well as for his great sense of humor. Above all, he had the ability to hold the team in games until we got going. On the occasions the puck eluded him, he never looked back or fished it out of the net. He became Ryerson President Kerr’s – who came to most of our games – favorite player. In a ’63 season game against Laurentian, Jack – one of the last Ram goalies to play without a mask – was hit on his head with the puck but stayed in the game. 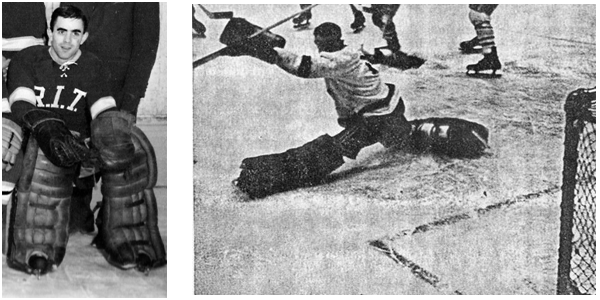 The report in the Ryersonian newspaper the following day noted “Goalie Jack Morgan sported a beautiful velvet shiner around his left eye, the result of his reluctance to give another goal to Laurentian Saturday night”. During Alumni events, Jack used to love to regale the younger Rams a story about a game against the Waterloo Golden Hawks when a Hawk player sprayed him with snow. Jack became so agitated at the guy, he gave him a good chop on the back of his legs with his stick. When the much bigger Hawk dropped his gloves and invited Jack to fisticuffs, Jack immediately called to his nearest defenseman to “help me out”. The reply was “I can’t Jack – he’s my best friend”. After graduation from Ryerson in 1964, Jack worked at Eatons and later became a real estate agent for 36 years. He remained active in hockey, coaching in Scarborough, playing for Eatons and through his company, Huntingwood Real Estate, sponsored the Agincourt Old Lions. Blackjack was also an active RRHA member and played in many annual Alumni golf tournaments along with his best Ram buddy, Don DesJardine #7 and attended RamNite functions at the Mattamy Athletic Centre wearing his retro RIT #1 sweater – often the first to arrive. He was not only a leader on the ice and in the room, Jack carried a human warmth and caring about him throughout his life for his teammates.We were privileged for having known and played with him. Our sincere condolences go out to his wife Sharron, children Timothy and Jennifer, his six grandchildren and sister Gail Wallace.